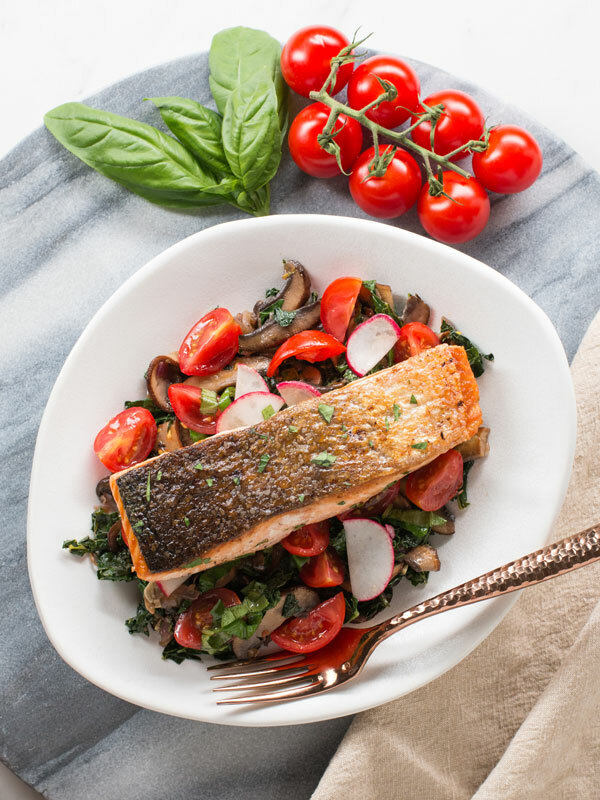 Low carb keto recipe for crispy skin salmon and veggies. 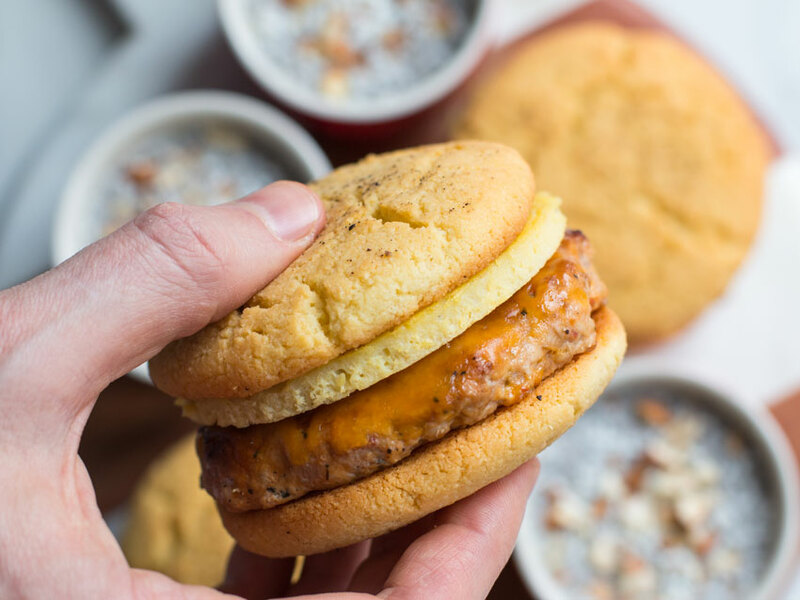 You gotta love keto recipes that only takes 20 minutes and are full of flavor. The absolute key to making the best crispy skin salmon recipe is allowing the salmon to sit in the fridge skin side up for at least 30 minutes. This allows the skin to dry out – any moisture on the skin will prevent it from getting nice and crispy. Ideally you want 1 hour in the fridge or up to 4 hours. I have even done overnight and the skin was so dry that it made for a potato chip-like skin when cooked! 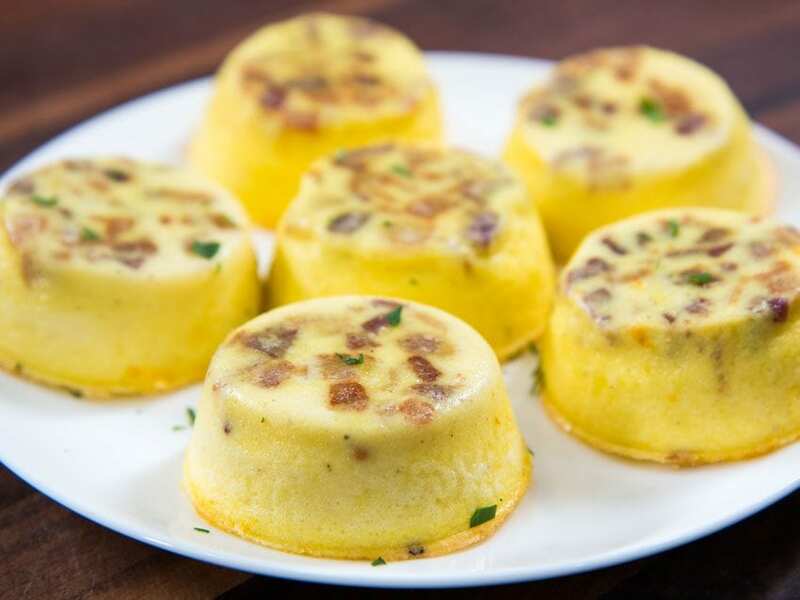 If you follow the keto diet, then you are looking for low carb recipes that have big flavor and allow you to attain ketosis and lose weight. 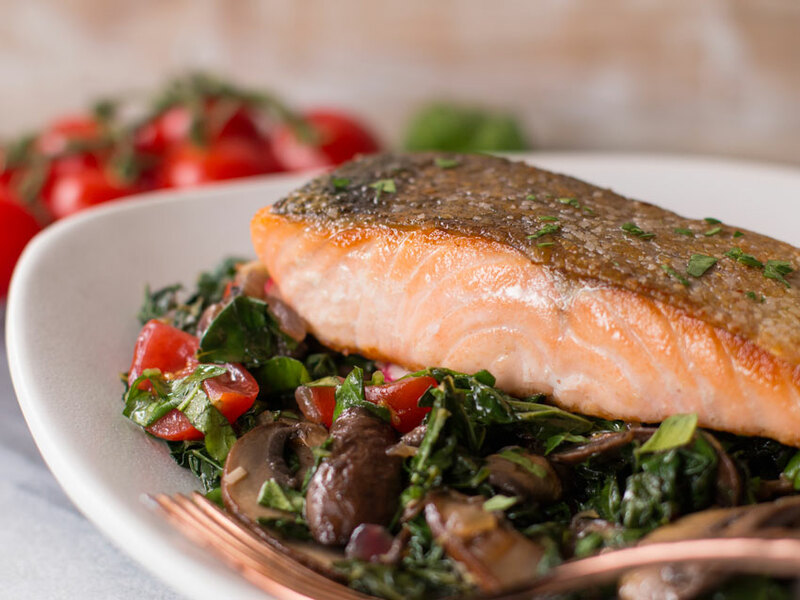 This salmon recipe is high in healthy fats and incorporates low carb veggies like kale, mushrooms, and tomatoes. 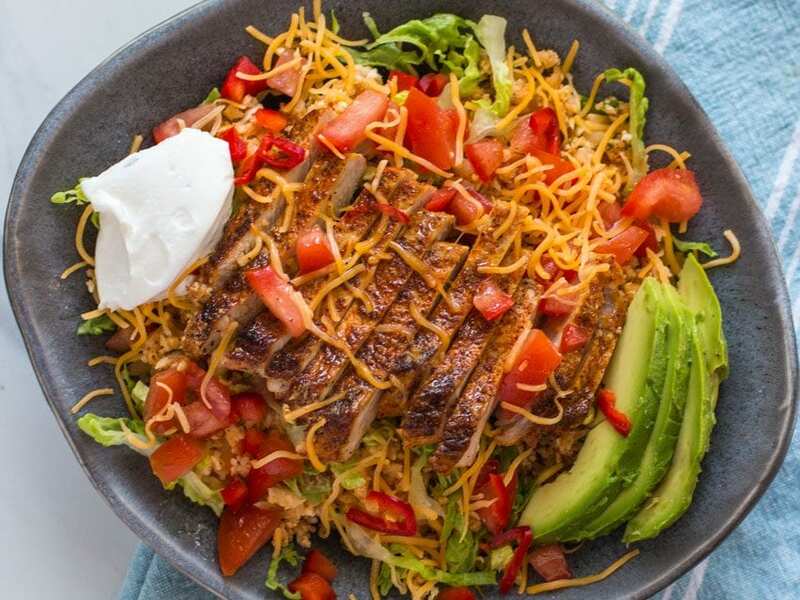 Imagine making this entire low carb recipe in only 20 minutes which serves two people – absolutely brilliant. 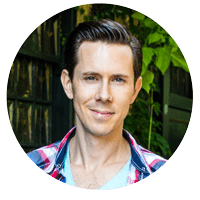 I have been working on the best low carb recipes for you guys, meaning they actually have flavor and creativity unlike lots of the recipes out there. I made this entire meal on my FlavCity YouTube channel in 20 minutes. Check out the macros under the recipe. This is the perfect quick and easy keto recipe for a low carb diet. You have to know what kind of salmon to buy at the store. I usually buy high quality farm-raised salmon from Whole Foods. 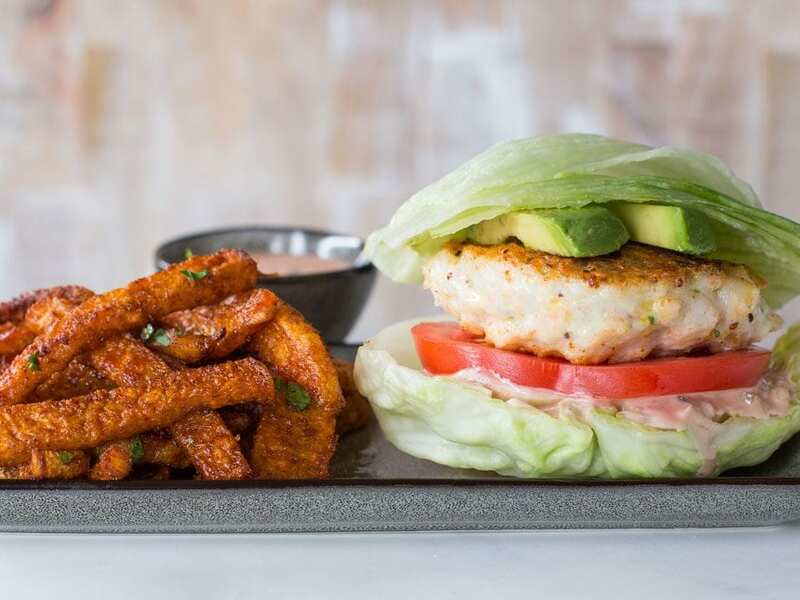 Farm-raised gets a bad wrap because much of it is done improperly, but when you buy high quality farm-raised Atlantic salmon, its buttery and delish. Because the salmon has a higher fat content, you can make salmon recipes that are juicy and don’t dry out. 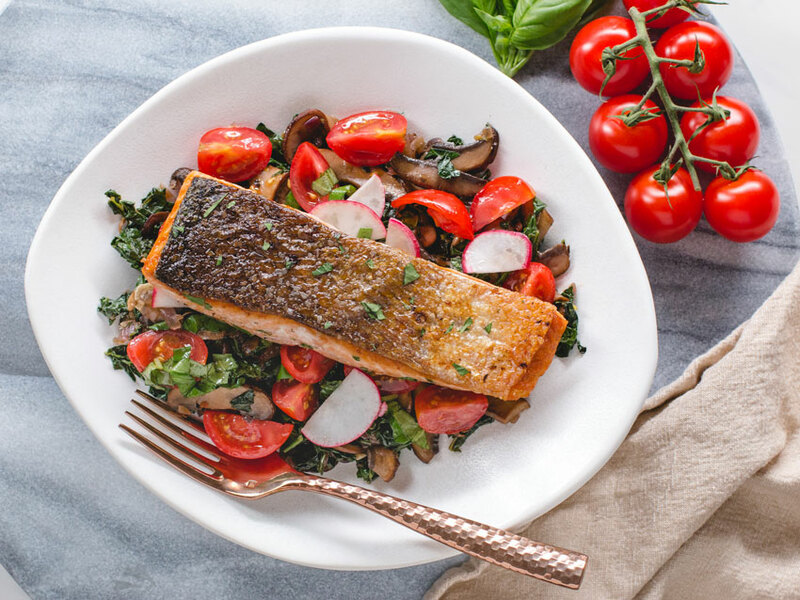 You need to cook the salmon for this recipe over medium-high heat skin side down for 80% of the cooking process, and then flip and finish cooking on the fleshy side over medium heat. Watch the video to see how I do it. I have two other yummy salmon recipes that you guys should check out. Asian salmon patties with low carb noodle stir fry and salmon lunch meal prep with a roasted cauliflower salmon. low carb salmon recipe for the keto diet. 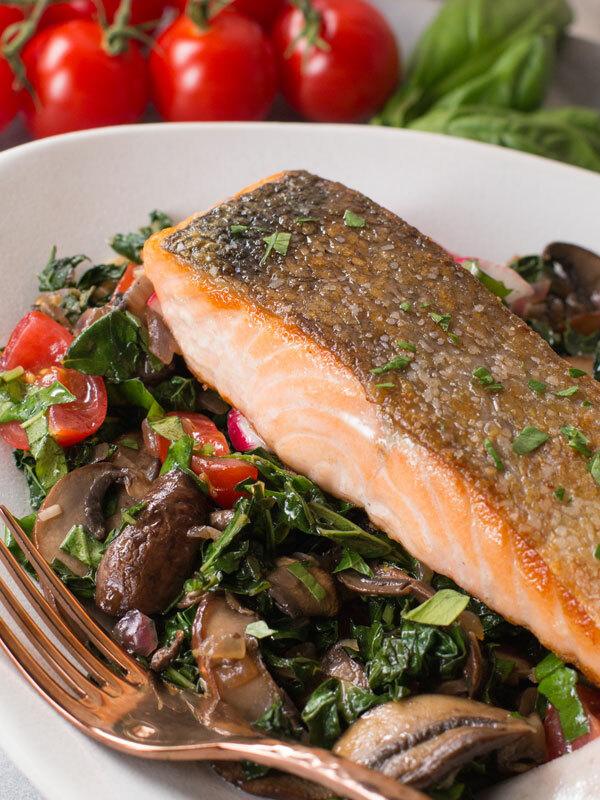 Low carb keto recipes for dinner with crispy skin salmon and veggies. The perfect low carb dinner recipe in just 20 minutes. Store the salmon in the fridge skin side up for at least 30 minutes, or up to 4 hours. The goal is to dry out the skin which helps make it crispy. Meanwhile, remove the stems from the mushrooms and slice thin. Pre-heat a large non-stick pan just under medium-high heat along with 2 teaspoons of oil for 2 minutes. Add the mushrooms and cook for 5 minutes. Remove the stems from the kale and roughly chop. After 5 minutes, add the onion and red pepper flakes to the pan along with ¼ teaspoon salt and a few cracks of pepper. Cook for another 5 minutes until the veggies are soft then add the garlic, cook for 1 minute. Add the chopped kale and cook for 5 minutes then add another ¼ teaspoon salt, the chicken stock or water, and cook until the kale has wilted and is soft, about 3-4 minutes. Turn the heat off and add 1 teaspoon of lemon juice and the zest of half a lemon, check for seasoning and adjust if necessary. Add the quartered tomatoes, sliced radishes, and parsley/basil to a bowl. When ready to serve, add the salt, pepper, olive oil, and mix well. Only do this right before serving. For the salmon, pre-heat a non-stick over medium-high heat for 2 minutes, add 2 teaspoons of oil and wait 30 seconds. Season the skin side of the salmon with a generous amount of salt and place skin side down in the pan. If the oil is not sizzling, remove fish and wait another minute. Season the top side of the salmon with another pinch of salt and allow the salmon to cook undisturbed for 5 minutes. You know the fish is ready to flip when edges on the top turn white and opaque in color. Flip the salmon, turn the heat down just below medium, and allow to cook another 3-4 minutes. If you like your salmon cooked all the way thorough let it cook 4-5 minutes total on the second side. You can also flip the salmon on the side and cook for 30 seconds each side, watch the video to see how I do this. You can squeeze the sides of the fish, if it feels firm but still has a little softness, then it is done. Remove from pan and place it skin side up. 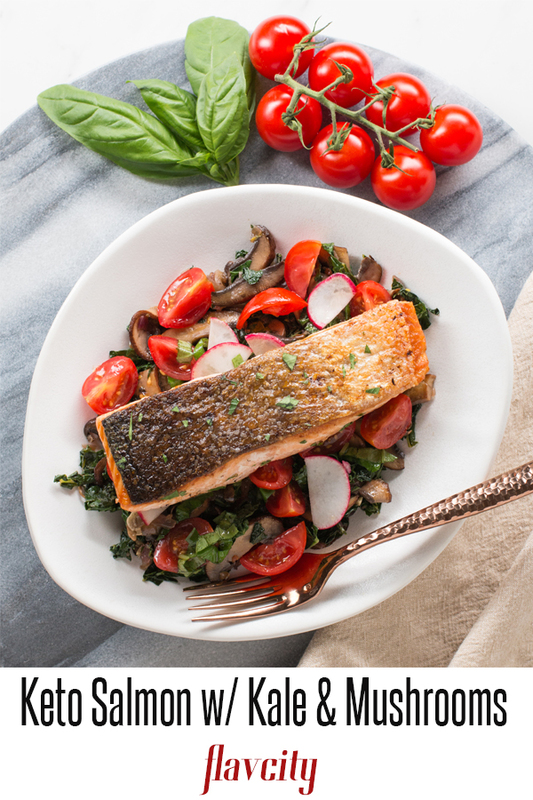 Serve the fish with some kale and tomato salad, enjoy! I use really good extra virgin olive for the tomato salad. Use my promo code to get a bottle for only $1 from the olive oil club. This is so delicious!! Thanks for sharing. You are most welcome Dana! I just made this recipe tonight and it was super easy and delicious! Thank you for your detailed information about timing and garnishing! You are the only person that does that! I made the salmon (although I used avocado oil because my hubby won’t touch dairy). Success!! First time I’ve ever made salmon with crispy skin. Sooooo easy! Thanks for the video! Crispy salmon skin is where it’s at! Glad you loved it! Keep on cookin’!